Thanks for stopping by The Spotted Tongue blog. I thought it was time to introduce myself a little bit to my readers. My name is Michelle Osborne, but I also go by Crysania (a name I've gone by on the internet since 1999 and which has become a "real" name for me over the years). I'll happily answer to either one at this point in my life. I live in the central part of the great state of New York, that fun and exciting place known for its lake effect snow. We take great pride in being the snowiest large city (population over 100,000) in the country, even though we'll complain about it from time to time (which means any time there's snow). I grew up around dogs and always had a great love for my canine friends. I remember having a newspaper route when I was in middle school and I knew all the dogs on the route. I enjoyed delivering papers not because of the people I got to meet or even because I had a little bit of spending money, but because I got to know all the neighborhood dogs. Some who often ran loose (this was much more common in the 1980s than now!) would follow me along the route and to home, where my mother would then load them into the car and return them to their owners. I had a wonderful dog growing up named Pepper. She was from a neighborhood "oops" litter. An unfixed Wheaten Terrier got loose, jumped a fence, and got someone's championship Miniature poodle pregnant. Oops indeed! 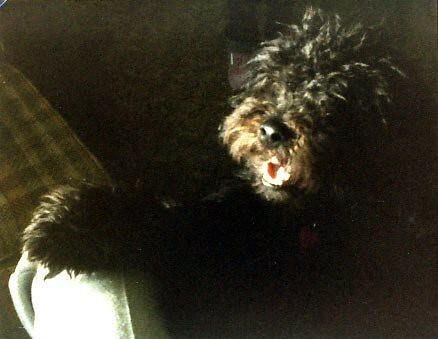 Pepper came home to us at 8 weeks old in April 1984 and spent the next 14 years of her life with us. She was an amazing dog. After Pepper died my parents got their second dog, a little white mutt named Teri. But I was living away from home by then and even though I loved Teri, she wasn't my dog. I wanted my own dog but for a time I wasn't in a place where I could have one. Early in 2008 I began doing rescue transports (which I have chronicled on my Diary of a Dog Transporter blog) to help dogs who needed to get out of shelters and to rescues. I started doing it in the hopes of scratching that "must get a dog" itch. It didn't work. 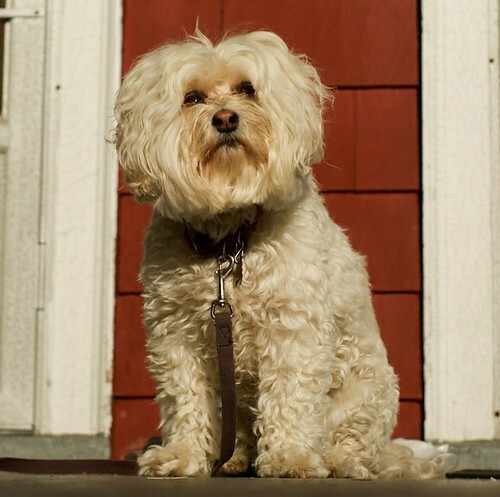 My partner (David) and I ended up moving to a new place and adopting our dog Dahlia in 2008. I cannot imagine my life without her. Check out the "About Dahlia" tag for more about my girl! 1. Photography. I'm a huge photography nut. You'll find many photos here of Dahlia. I currently use a Sony A580 camera with various lenses (I think I have 8 lenses at this point). But in the past I've used a Sony A230, Panasonic Lumix DMC-FZ18 (and still do sometimes in the colder weather), and a Canon SD600. 2. Agility. This is another one of my major interests in life. I started agility in 2010 with Dahlia and have been going to trials for a year now. It's so much fun and I cannot imagine how I didn't do this before! 3. Dog training. Specifically, positive reinforcement training. I almost solely use +R training now, with some mixing in of -P (negative punishment -- taking away something the dog wants to decrease a behavior). You will not find me looking very kindly on those who choose to use punitive methods of training. There's simply no need. 4. Rescue/transport work. While I'll discuss some rescue things here, most of my transport work can be found at the link above. So, you've only trained one dog, and now you're an "Expert". Let me guess...shock trainer who's butthurt? I never called myself an expert.